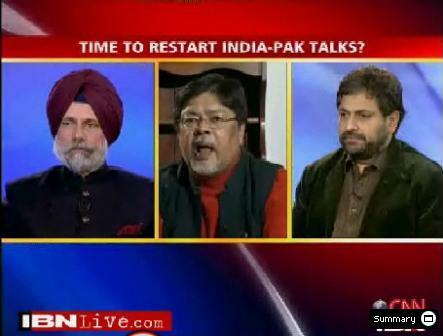 Watch me @ CNN-IBN: Time for India to start talks with Pakistan? I was on CNN-IBN’s ‘Face the Nation’ with Sagarika Ghose discussing whether India should start talks with Pakistan. Co-panelists were Ambassador K.C. Singh (pro-dialogue) and Chandan Mitra of the BJP, who was opposed. You can watch the 20 minute video in four-parts starting here. There is nothing to talk about, all a waste of time , staus quo is fine . Factor in the cost a terror attack by pakis per year and a Retaliation raid by india in return and move on . Call it cost of living with loons next to you. Any thing else will only encourage them for more terrorism as they correctly see call for talks as weakness or under western pressure. No Talks with Pakistan have worked so far. The truth is that people running Pakistan are not bureaucrats, but it is the military which always has the final word. Nawaz Shariff or Zardari will never be as powerful as Musharraf. And talking to the military is of no use, because we can never be sure whether we are talking peace to Jihadis in military uniform. Sir!! Has dialogue with Pakistan for the last 60+ years helped us? no!! it is time to break all diplomatic relations until they hand over Dawood, Saeed, and other terrorist. This entry was posted on January 29, 2010 by Siddharth Varadarajan in Indian Foreign Policy, Pakistan.